Title text: "People tell me I have too much time on my hands, but really the problem is that there's too much time, PERIOD." Isn't there a repeat in the date...? Oh wait... it's fixed already. I must have been thinking... *sunglasses on* backwards in time. Last edited by Persona on Wed Feb 15, 2012 3:59 am UTC, edited 1 time in total. Why is the percentage counting down to 0% now? I feel like 0% should be the beginning of the universe, and it should count up to 100% when it reaches now. Or if this is about waiting, then 100% should be some point in the future. Re: 1017: "Backwards in Time"
Well he can keep the formula the way it is, with the percentage changing more rapidly as you approach now. Just that the result should be (100% - the current number). I think I'm not quite explaining myself right, let me try again. Somehow that seems more satisfying to me: all of history has been progress towards my download finishing. In fact, my three hours of waiting is only the last part of the download process - by the time I start waiting, it's practically done! And so the freelanced creation of this application begins. Also, having the listing as 0%=now, 100%=Big Bang gives for a more explosive finish. You're starting a download now, and you're timing it comparative to all time, therefore you can't also finish now, you're finishing in the past. It's just one thing that's letting you be more like David Tennant, don't overthink it. I'm trying to make an extreme sport out of watching him waiting. EDIT: Also, if you change "output=html" to "output=csv" in the spreadsheet url, you can download the actual values. Linky. the image is a link to a spreadsheet. it contains a listing of other big events that occurred during the (known?) existence of the universe. Using 20.3444 as in the comic, I get 13.7513 billion years. However, using 20.3450 yields 13.75956 billion. 100% : 13.76 billion years ago! Last edited by Venetian Road on Wed Feb 15, 2012 5:59 am UTC, edited 1 time in total. "Cannot run out of time. There is infinite time. You are finite. Zathras is finite. This... is wrong tool. No. No, not good. No. Never use that." "February 27, 1984 - I'm born"
12 days to 28, happy early birthday, Randall! "September 23, 1733 - Enlightenment, Enlightenment" Now, with twice the enlightening! muntoo wrote: Dammit, I'm mad! God, a red nugget; a fat egg under a dog! Why are we palindoming again? (Although on the note of palindromes and dates: it struck me recently that 2012-12-21@21:02 will be a palindromic datetime. :twilight zone music: The world ends at 9:02 PM! It would be even more awesome if he made the script so that it had microsoft sam read the first lines of the corresponding wikipedia article for each era! Hmm...I've downloaded both the Excel spreadsheet from XKCD, and the csv from here - and neither seem to have the actual formulae in them. Have I done something wrong? I'm using Firefox 10.0.1 on a PC. Definitely hold out for version 2.0 with selectable universes. Last edited by inductiveload on Wed Feb 15, 2012 3:06 pm UTC, edited 1 time in total. StClair wrote: "Cannot run out of time. There is infinite time. You are finite. Zathras is finite. This... is wrong tool. No. No, not good. No. Never use that." "You are the One who was. You are the One who is. You are the One who will be." I cannot but refer to an old writing of Asimov. Well, 44.9694% is now my favorite percentage. You know, I might try and see if I couldn't write a program that allowed you to input an amount of time, press *start*, and then watch it give you things that happened at intervals. Last edited by dhokarena56 on Wed Feb 15, 2012 1:37 pm UTC, edited 1 time in total. "Man, it feels like I've been sitting here so long the dinosaurs would be dead already." "Nay, we got another 5 minutes." Is Randall friends with someone at Fitocracy? This is the only place I've ever heard it mentioned. The first time, I tried it out and didn't care a lick for it. I can't believe no one has commented on the 31.12% box. I couldn't stop laughing when I read "Windows 95 debuts. OJ found not guilty." Hm, when I open the spreadsheet in OpenOffice I get "Err:508" messages in the "How far back", "What's Happening" and "How long ago" boxes. Seems to be a case of an error in parantheses, ie there are more opening parantheses than closing ones or vice versa. But there's nothing wrong with the parantheses, as far as I can tell (69 opening ones, 69 closing ones). So, the way I read this, Randall is the ultimate in long-suffering. Misellaneous person: "So, how long was that lecture, Randall?" Randall (with deep suffering): "At least as long as the age of the universe." Ambiguous punctuation is fun. I'm heartened to discover OJ was not responsible for Windows 95. This signature intentionally left empty. also enjoyed the Zathras comment. fitting. I <3 you for the B5 quote. Zathras was one of my favorite characters. "Zathras is used to being beast of burden to other people's needs. Is very sad life, will probably have very sad death, but at least there is symetry." "Zathras talks to dirt, sometimes talks to ceiling and walls but dirt is closer." 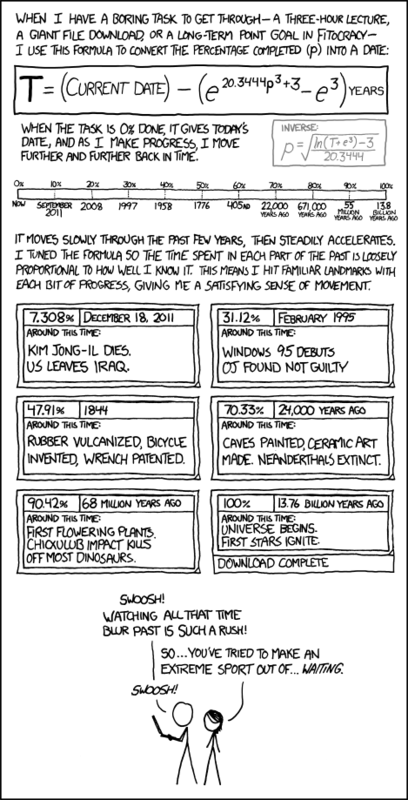 Like Dunbar in Catch-22, I read xkcd comics in order to extend my own life through boredom. lotharofthehillpeople wrote: I think I'm not quite explaining myself right, let me try again. Watching things go slower and slower as you approach 100% would be agonizing for something like a long lecture or an hour+ on a treadmill. The comic's solution is best. Now someone make me an app I can watch while on a treadmill. glasnt wrote: And so the freelanced creation of this application begins. Yeah, it's all that wibbly-wobbly timey-wimey stuff.